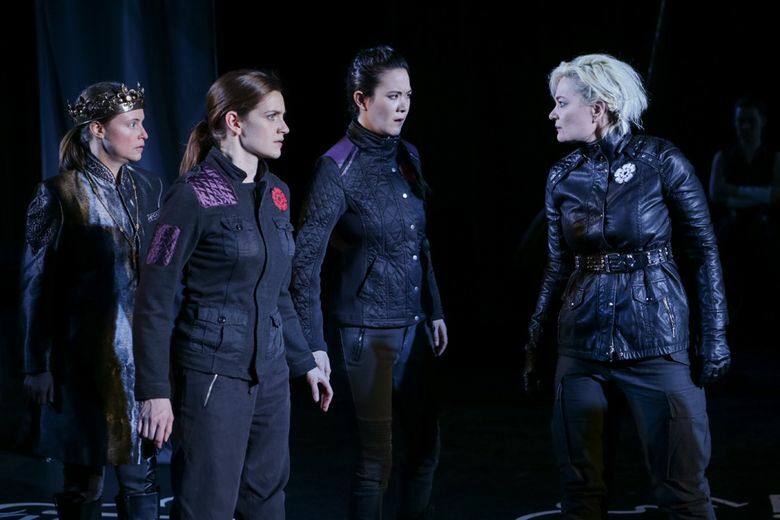 In this absorbing, fast-paced, two-part conflation of a trio of Shakespeare dramas (“King Henry VI,” Parts 1, 2 and 3), an all-female cast directed by Rosa Joshi enacts an internecine fight for the British throne. We’ve heard a lot about the peaceful transition of power since our country’s fiercely fought 2016 presidential election. And whatever you think about the new regime, Seattle Shakespeare Company’s “Bring Down the House,” presented with the upstart crow collective, makes you glad we’re not back in 15th-century England. In this absorbing, fast-paced, two-part conflation of a trio of Shakespeare dramas (“King Henry VI,” Parts 1, 2 and 3), an invigorated, all-female cast directed by Rosa Joshi enacts an internecine fight for the British throne. Heads roll. Mobs foment. Battlefields are soaked in the blood of warring fathers, sons and cousins. Backstabbing begets revenge begets more backstabbing. Adapted by Rosa Joshi and Kate Wisniewski from William Shakespeare’s “King Henry VI” trilogy. Through March 12, Center Theatre, Seattle Center; tickets from $31 (206-733-8222 or seattleshakespeare.org). It’s a cautionary saga, and the authorship is still under question by scholars; some believe Christopher Marlowe was the Bard’s co-author. The exalting poetry of Shakespeare’s better-known dramas is in short supply here, and obvious historical liberties are taken. But the treachery and thunderous violence Elizabethan audiences craved (along with fans of modern action flicks) are amply supplied. What’s most at stake in this crisply wrought co-adaptation by Joshi and actor Kate Wisniewski? How an all-female cast brings off all the brawny machismo. And whether this critically downgraded epic is worth the effort. Actually, it is. But first, a brief literary history lesson: The “Henry VI” trilogy covers the volatile period between the reigns of two British monarchs immortalized in better-known Shakespeare efforts: Henry V and Richard III. The text of Part 1 opens with England’s declining fortunes in France, but “Bring Down the House” skips forward to the court of Henry VI (the heir to lionized King V, played by Betsy Schwartz), as the Plantagenet royal reign starts to split apart. Less commanding, more trusting than his father, Henry VI is slow to comprehend the dangerous rift between the loyalist Lancasters and scheming York (a hard-as-nails Mari Nelson) and his faction. Henry relies on the wisdom of his astute uncle-adviser Humphrey (Marianne Owen, ably replacing the injured Suzanne Bouchard). But he heeds warnings of rebellion too late. What unfolds next, over the five-hour-plus production, is a chain of dastardly schemes, torn allegiances, assassinations, problematic marriages and images from a horrific civil conflagration in the War of the Roses (the House of York’s symbol is a white rose, while the House of Lancaster’s is red.) Along with the waste of life, it blows up the ideal of chivalry among knights, and begins the ascent of a wily, leering son of York (aka Richard III). Performed straight through with few edits, the “Henry VI” trilogy can be a bloody bore. It’s action-driven, but even oozing heads on spears lose their shock value after a while. But machinations and abuses of power and senseless warring are, sadly, subjects that still resonate. And Joshi’s abridged, lively staging makes its own case. Visually stark, it ingeniously employs high-backed chairs and Geoff Kort’s pinpoint lighting to zip us through animated choruses of exposition, and many shard-sharp scenes. The large, tight, acting ensemble doesn’t miss a beat as they rip along. As for the gender switch, “Bring Down the House” certainly proves well-trained and hardy women thesps can “man up” to swing a sword, grunt and groan in combat and diss one another with as much force and relish as their male counterparts. Most textured among others are Schwartz’s Henry, Owen’s Humphrey and Kate Wisniewski in the meatiest female role of ferocious Queen Margaret. And a muted ballet of embrace and loss mines the pathos of soldiers who, in the fog of war, have slain their closest kin — for the vainglory of their masters.